Continuing our “Signs of an Amish Home” series, let’s have a look at milk cans. Milk cans seem to be another one of those quintessential symbols of the Amish–who else uses them nowadays? A few other Plain groups perhaps, but not many others. If you see them stacked up by the road or by the barn, that’s a sign of a likely Amish place, and in particular a conservative group. “Mainstream” Amish use bulk cooling tanks nowadays, which also have agitators to keep the milk moving. Donald Kraybill in The Riddle of Amish Culture tells us that this technology was first adapted by Lancaster Amish in the late 1960s. Conservative Amish do not allow this innovation, and use old-fashioned cans. This also means they typically can’t sell their milk for the highest price. So milk from conservative Amish is classified as grade “B”, and goes to making cheese. 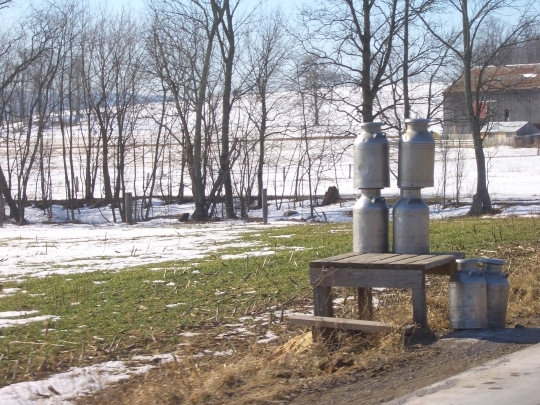 Amish who store their milk in cans often keep it in troughs of cool water to provide some cooling as it waits to be picked up by the milk truck. I learned of some other interesting milk practices in Karen Johnson-Weiner’s book New York Amish. One Amishman explains that “Amish dairy farmers are exempt from shipping milk on Sunday if they put ice in the water in which the milk cans were stored.” Amish in his community had plans to “put ice up” the next winter (p. 117). 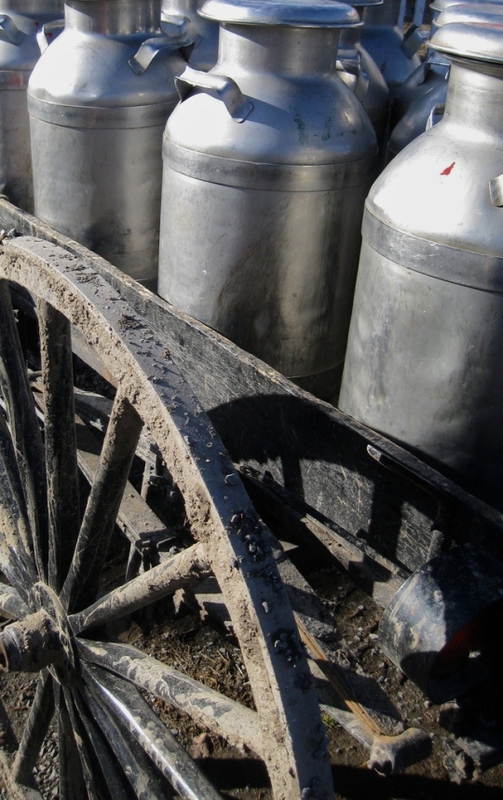 Because milk truck drivers would no longer go to individual Amish farms to pick up cans of milk, the dumping stations would make the non-Amish world less intrusive in the daily life of the Swartzentruber settlement; farmers would deliver their cans of milk to the dumping station by horse-drawn wagon (p. 76). Richard those cows know if you’re a rookie. And I find they don’t much like rookies. This will be my last regular day online for a while as I move my computer over to the other house today. I will be around hit and miss until the move is completed the end of August. Happy move Alice, and we’ll look forward to hearing from you once you’re in the new digs. You reminded me where I see these cans outside of the Amish; they are popular for planters and decorative pieces aren’t they. I remember my great-uncle still used milk cans here in rural New Brunswick, back in the 1960s. 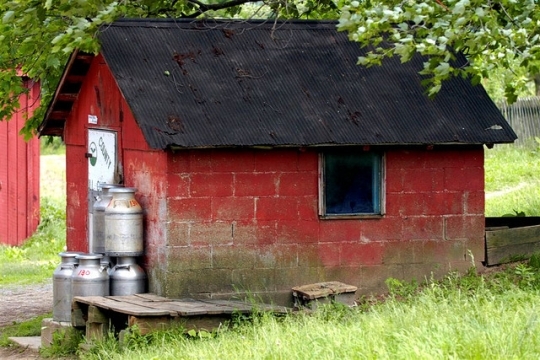 The red block building looks like a spring house, another way to keep milk cool. The water flows into a concrete or stone trough from the spring, and then through an outlet. People here had spring houses until 30-40 years ago. Magdalena some of my Lancaster friends have a spring house as well, but they don’t use it (at least not for milk cooling). It’s a 200-year old farmhouse, so I’m sure it was used pre-bulk tanks. I remember when I was a kid the milk cans my aunt and uncle use to have on their farm. They were not Amish or Mennonite, but that’s what all the dairy farmers used when I was a kid. The truck use to come around and put the milk in the back tank on the back of the truck. Of course that was in the days before we had all the different kinds of milk we have today. What came out of the cows was what we drank and we lived through it, too. Marilyn this week my father and I have been digging into a hunk of cheese I brought back with me from PA when I was there in February. Homemade by some friends, at this point nicely aged. I think I’ve mentioned on the blog before that after visiting an Amish dairy at milking time and witnessing the process he swore off drinking the raw milk (he used to be a tobacco-picking country boy but has been citified to fear these things apparently). But he doesn’t seem to have a problem with the raw milk cheddar cheese that comes from it–he’s loving it 🙂 I guess he’s far away from the farm it came from to not think about the production process. I can remember when we used to get our milk delivered by the Milk Man, it had the cream floating on the top of the milk, and my mom would scoop it off and use it for coffee creamer. That was the best milk…probably NOT low fat, but boy was it delicious!! What exactly is the process to make cheese?? >but boy was it delicious!! Separate the curds from the whey. “Cheese cloth” is was originally used as a filter for doing this. Feed the whey to the pigs. Add a bit of salt to the curds. Put the curds into a cheese press to remove more liquid and form into a round shape. Store the cheese to let it age. Different cheeses have slightly different recipes of course. Here in New England Cheddar was the common way to preserve and ship dairy products for a long time (butter was a medium term way to store it). The tight cheddar wheel would basically be airtight inside to preserve it, and you could just slice any mold away from the outside. In Italy, styles like Ricotta would be a fresh cheese to eat, while Parmesan is essentially a salted and dried Ricotta cheese meant for long term storage. BTW, I’ve recently started buying raw Jersey milk from a small local farm that specializes in it. Not sure if I’ll continue or not, but so far I haven’t had anything bad to say. I’m planning to make some clam chowder tomorrow, and it’s nice all I have to do is get cream from the top of the bottle in the fridge, instead of running out of a container of it at the store! The dairy that Daddy managed in Maryland acquired their milk from Amish farmers in Western Maryland and Pennsylvania. I remember when we lived neighbors to the Ashery Cheese House, where all the local Amish Farmers would come each morning with their cans of milk on the back of their hacks. They would dump the fresh milk and return home with whey in the cans to help fatten their hogs before taking them to the Mt Hope auction. Plus every farmer that dumped milk bought their cheese at a discount. I am in a raw milk buying co-op; we buy milk and cheese from a dairy farmer who lives about 70 miles away. We take turns going over to pick up the milk, with each member driving over once every three months. The last time I was there I was surprised to see that he had milk cans in the cooler. All of his cans were stainless steel, which I didn’t even realize that they make. He said that he was about to start making another batch of cheese and he stores the milk for the cheese in the cans until he is ready. 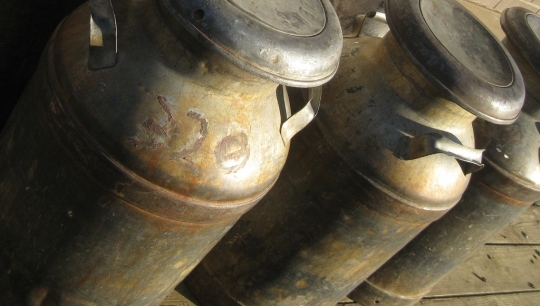 Otherwise I have not seen anyone actually using milk cans since I was a child and we visited a relatives dairy farm. As opposed to me who pays about a 50% premium for it! And that’s because I otherwise buy lactose free; it’s probably double the price of regular milk. The Amish in my immediate neighborhood (if you can call it that – the country roads where I live) are Swartzentrubers and use milk cans. The cans are always sitting outside along the road on little wooden platforms. The milk truck is not a standard tank but is like a cooler box truck with shelves inside to hold the cans. And those milk cans loaded with milk are heavy!! There are many cheesehouses around here which take the milk. My husband is a milk truck driver and picks up from Amish and English farms. Most of the Amish (less conservative) farms where he stops use generators to cool their bulk milk tanks. You have to use a different “attachment” on the tank milk truck to pick up from the Amish since they don’t have standard tanks. My husband is able to pick up from some Amish farms and most Mennonite on Sundays. Often in the summer a home will be hosting church and he is out there loading the milk while they are in the barn having their service. Amish farm milk pick-ups on Sunday? But I’d never heard of a milk truck coming by on a Sunday during church, especially not to a conservative Swartzentruber Amish farm. Erik, the Amish farms that can be picked up on Sundays are not Swartzentruber or super conservative. We also have conservative Mennonites which do not allow Sunday pick-up.